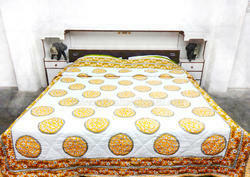 Providing you the best range of hand block printed cotton quilts with effective & timely delivery. Neatly done hand- quilting in patterns according to the designs makes it look more attractive than normal quilt. A fine product from expert artisans of Jaipur.